There's nothing normal about Simian. Their artwork is extremely deranged, mutating goats with dogs, swans with ostriches and deers with bats. Their website reads as a 19th Century science textbook and the aptly titled Chemistry Is What We Are (the band's debut album), does what it says it does, pushing the musical envelope using sounds unheard of and transforming these odd sounds into music. This music falls slightly into leftfield, somewhere between sweet melodic pop, overwhelming psychedelia, experimental folk and electronic noodling. The early Beta Band comparisons they received are flattering, for The Beta Band that is. From beginning to finish, this record is a rollercoaster ride, with its constant shift in moods and noises. There are moments that seem dark ("Round and Round"), friendly ("One Dimension") and quite dreamy ("Doba"). "The Wisp" is unlike anything else, with its bubbling frequencies, falsetto vocals and slow, parallel beats. Confusing, it may be, but this album is not a challenging listen, it is a magical one. The songs flow together as if it was a journey through The Wizard Of Oz (if it had no songs) or C.S. Lewis' The Lion, the Witch and the Wardrobe. 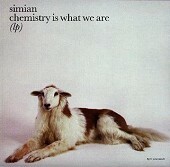 Simian is as inventive as you would want a pop band to be. They delve deeper into the limits of experimental pop without wandering into endless, pointless jams. Chemistry-- is a trip that needs to be taken with or without the drugs.